Posted at 19:07h in Cycle Class Tips by Justin G.
Charlottesville’s boutique fitness community is exploding—and certainly nobody is more excited than us! With so many choices, it’s very important for fitness consumers to make sure their workout dollars are well spent—that the businesses and methods they patronize are backed up by actual science and not fads. Specifically, I had a rider come tell me recently that they heard from a personal trainer (!) that indoor cycling — particularly riding with resistance – will make your legs bulky. At first blush, it kind of makes sense, no? If you’re pushing into something heavy, it’s like lifting weights—and lifting weights makes you gain muscle, right? Just in case you want to stop reading now: That is incorrect and easily refuted with basic cycle science. The absolute slowest we ride indoors is around 50 RPM—that means 50 full revolutions per minute with each leg pushing 50 times. Think for a moment how light weights on a leg press, for instance, would need to be for you to do 50 reps in a single minute. Do you see yourself bulking up on those? Of course not. 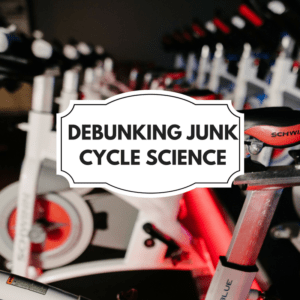 Beyond that, though, this myth completely misidentifies and misunderstands what cycling is, how the body works, and how and what makes muscles grow. Your muscles are made up of slow twitch and fast twitch fibers. Indoor cycling only works slow twitch fibers—those which affect muscular endurance and how long you can exercise before reaching a fatigue point. Working fast twitch muscles by lifting heavy weights in short sets is how you add bulk. In other words, what we’re doing in indoor cycle classes is simply not capable of adding bulk. Cycling classes, however, do have the side benefit of burning a tremendous amount of calories (if you ride with resistance) because your quads, glutes, and hamstrings are already some of the biggest muscles in your body and big muscles burn lots of calories when put to work… but slow twitch activity won’t make them any bigger. This particular brand of nonsense has actually seen its own “method” born. Riding very fast 45 straight minutes with very light resistance is an unfortunate trend in the industry that is rejected by EVERY credible national certification. This type of cycling is not effective and would not make many riders feel like they got a good workout. To compensate, they turn up the temperature — beyond what is safe/effective for cardio — to make riders fatigue sooner and sweat more: ta-da! instant “hard” workout! This “method” also provides no “after burn effect” (burning hundreds of calories AFTER you get off the bike) because you did so little during the workout itself other than making yourself tired and sweaty. Bottom line: Indoor cycling is an incredibly effective exercise modality. However, before you spend any time in a studio or gym, you should make sure their method is based in sound cycle science and their instructors hold a respected certification. All of our instructors complete a minimum of 100 hours of training in both how to create a fun AND effective workout for you.